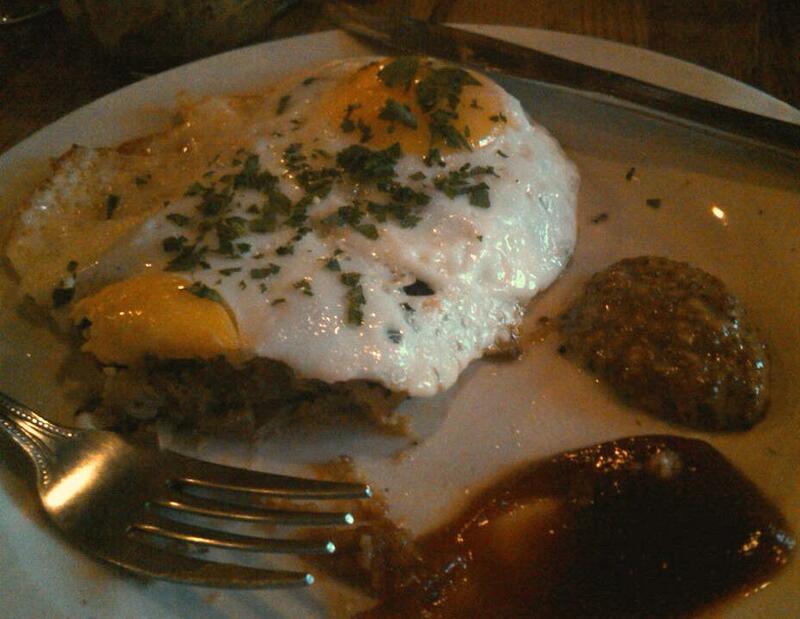 Scrapple and egg with house ketchup and mustard. A lumberjack must have decorated this place. A free-spirit lumberjack with industrial-chic sensibility, perhaps. Timber prevails at Grain & Gristle on Prescott at NE 15th Ave, represented in the exposed ceiling beams, floors, tables, chairs, benches and the bar at the center of it all. Cylindrical cages — baskets in which machine parts were dunked and washed, we learned — serve as light fixtures over the tables along either side of the room and contribute to the rustic vogue vibe. Blackboards announce the day’s specials, and a mixed-media mural of a grain harvester lends some amber-waves hominess. We’ve eaten here twice now, and both meals were engaging enough that we’re threatening to become regulars. Our most recent visit came just as the Last-Thursday craziness on Alberta was winding down. (Perk No. 1 at G&G: They’re open late.) So, what were the winners? During our first visit, J fulfilled his gastronomic duty and ordered the burger. Though he specified medium-rare, it arrived well-done, breaking a cardinal rule of burgerdom: The patty had shrunk and was smaller than the bun. But flavor and texture were delicious. So on our return he gave the burger another shot, with slightly better results — again a good crust on the patty, juicy, perfectly seasoned, but more medium than medium-rare. There’s some deviousness at work here: Even overcooked, the burger is good enough to keep us coming back, ever hopeful of perfect execution. Overall, G&G is a welcome addition to our neighborhood. (Even more so now that the patio is open for business.) Get the burger right, and we will be friends for life. I love breakfast for dinner, but forget the mustard and ketchup. pass the tabasco please. maybe the third time will be a charm for a medium-rare burger. Well, if a restaurant makes their own mustard and ketchup, I feel obliged to try it … and it was tasty. That said, if we ever open our own restaurant, you can bet there will be some fiery hot sauce with the scrapple, and eggs, and chile verde, and everything!